- Can enjoy beautiful rattle music when your baby is playing. - Develop your kid's capacity of thinking and imagination. - A great gift and musical instrument for your children, dance, teaching activities, etc. - Wrist bell with 4 bells on a durable silk ribbon circle, makes it easy for even the youngest player to hold on. - Gently shake the bell, it will make beautiful sound, baby will be interested in it. Premium Material: It made of nylon wrist and metal bell. Every wrist band has 4 bells. Adjustable strap fits for all the baby or children, multicolor and durable. Wrist bell with 4 bells on a durable silk ribbon circle, makes it easy for even the youngest player to hold on. 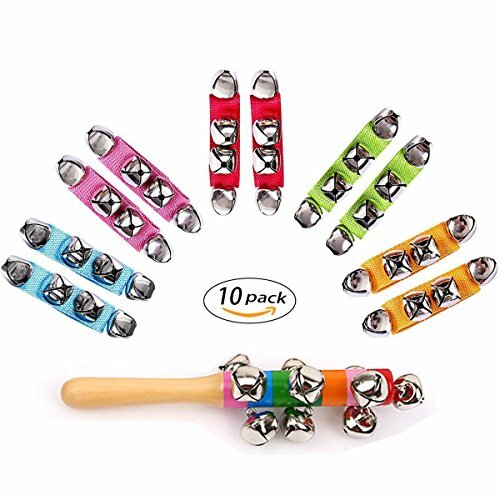 Color: Pink, Green, Blue, Orange, Pink, totally 10 pack( 5 pairs) and one wood bell. Suitable Age: It suitable for baby and kids, We suggest kids should over 6 months. If you have any questions about this product by Senyida, contact us by completing and submitting the form below. If you are looking for a specif part number, please include it with your message.